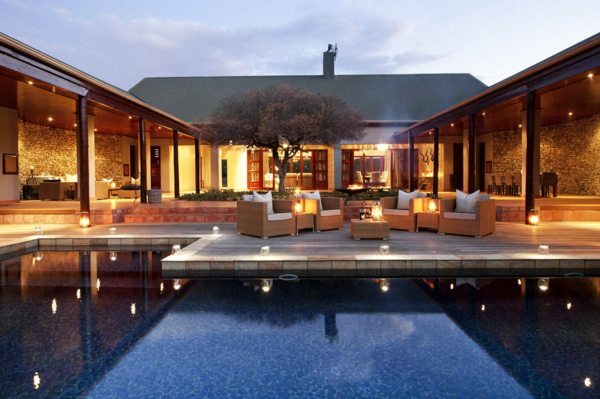 Cleverly designed and beautifully situated, the private suites and villas you’ll stay in on this luxury family safari to Namibia and South Africa will give you the space and exclusivity your family needs to enjoy Sossusvlei, the Garden Route and Cape Town in your own way, and at your own pace. 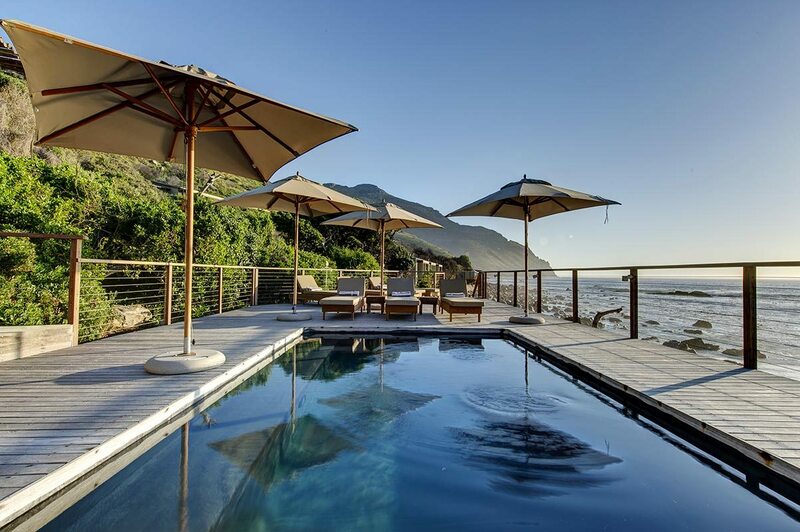 The sand sea of the Namib Desert gives way to the Atlantic swells along the Garden Route and the waves rolling into Cape Town as your itinerary takes you from a desert watered by sea mists to the very edge of the ocean. 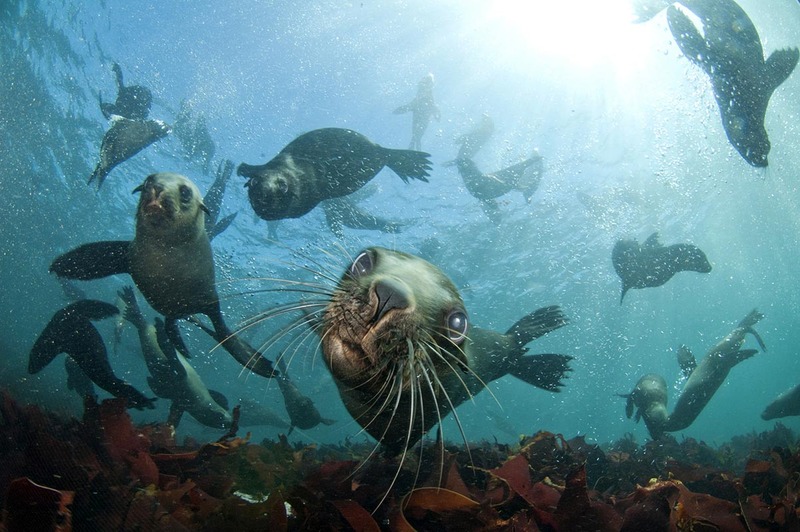 The chance to appreciate the ancient yet ever-changing desert landscapes of Namibia in their many moods, to got hot-air ballooning over the desert, to relax amid the unique natural beauty of the famed Garden Route, to tune into the multicultural vibe of Cape Town, to go on a Cape Peninsula Tour and to go snorkelling with seals. 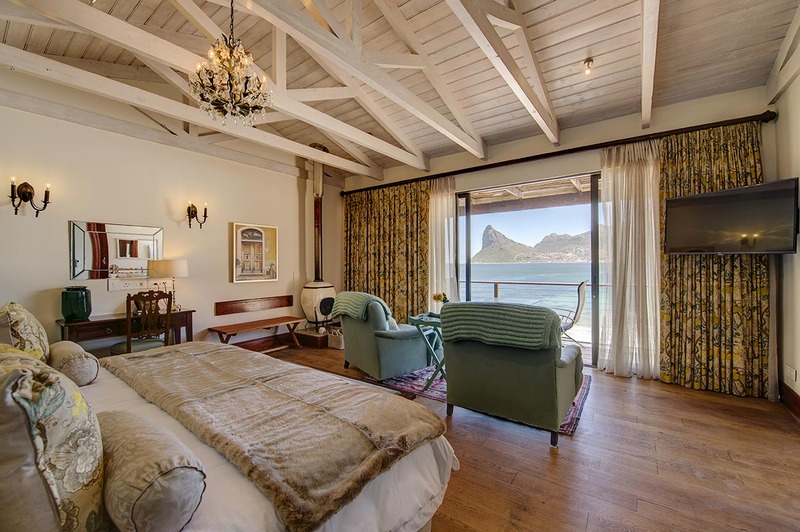 A private three-bedroomed tented villa at Private Camp (sleeping six), a chic farmhouse at Melton Manor (sleeping eight) and a two-bedroomed family suite at the boutique hotel of Tintswalo Atlantic (sleeping four). 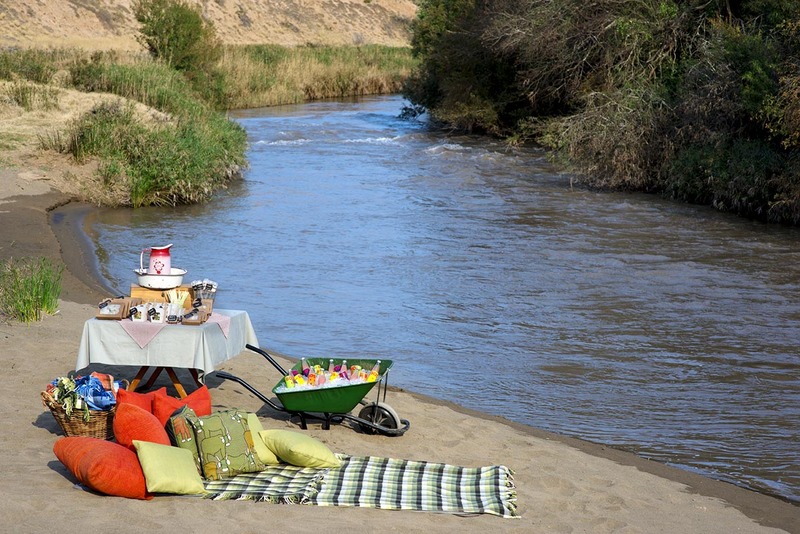 For more information see Private Camp, Melton Manor and Tintswalo Atlantic. 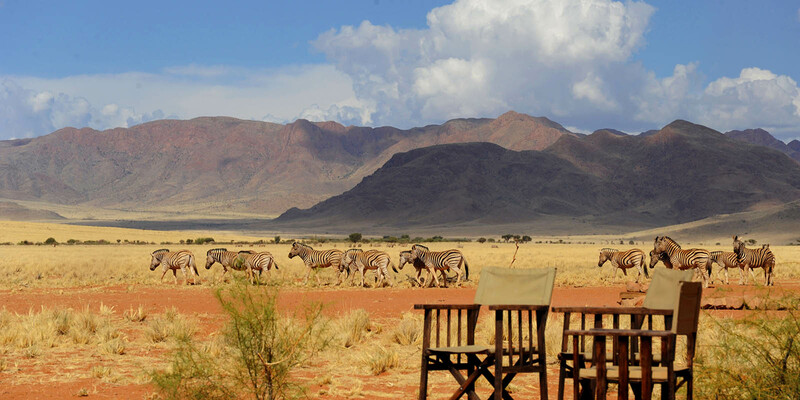 My partner joked that Wolwedans Private Camp does exactly what it says on the tin. 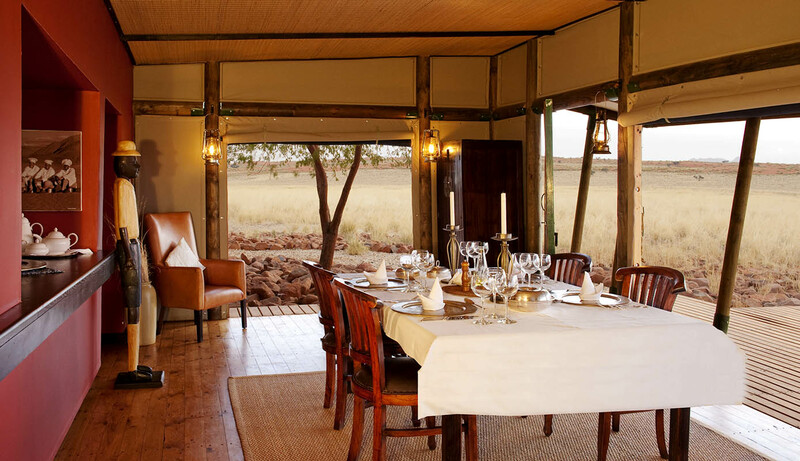 We were delighted to have discovered our very own family hideaway set deep in a valley in Namibia’s NamibRand Nature Reserve and, to enhance the wonderful sense of solitude created by the almost lunar landscapes, we’d booked private activities so that it would be just the four of us and our guide. After a family dinner, we spent our first evening in raptures, gazing up at the Milky Way, watching shooting stars, and treading gingerly on a scorpion safari. Who knew that they glowed under UV light?The next morning, we focused on just the one star, waking early to watch the sun rise, its rays chasing the shadows across the valley floor. The air was delightfully fresh, and while three of us clutched steaming mugs of hot chocolate, our eldest clicked away softly with her birthday camera. She’d already developed a real knack for photography, but as she explained, having time to compose her shots, and such inspiring scenery to capture, meant that she could hardly go wrong. As the first sunbeam reached us, we agreed that a lazy morning was in order, and had breakfast on the rocks.As if the views from Wolwedans Private Camp were not spectacular enough, my partner had secretly booked a hot-air balloon flight over the NamibRand Nature Reserve for us. My vertigo disappeared as nervousness was replaced by a sense of wonder. Knowing that the golden plains and rugged rocks beneath had been virtually unchanged for millennia reminded us that our time on Earth was fleeting in comparison, and that family moments like this were the very best way to spend it. Surrendering to gravity to enjoy a Champagne breakfast, we yielded to entreaties to share our Champagne with the girls.Our youngest daughter has always enjoyed horse riding, and the rest of us needed little persuasion to take a canter through the flaxen fields of the valley on our fourth day. It was another perfect moment we didn’t want to end, so we pulled gently on the reins to slow our mounts and try and stretch out each precious minute. Riding back to Private Camp, the setting sun cast giant centaur shadows ahead of us, and I found myself reflecting on how we seemed to have drawn even closer together as a family over the days we’d spend in this country of vast distances. 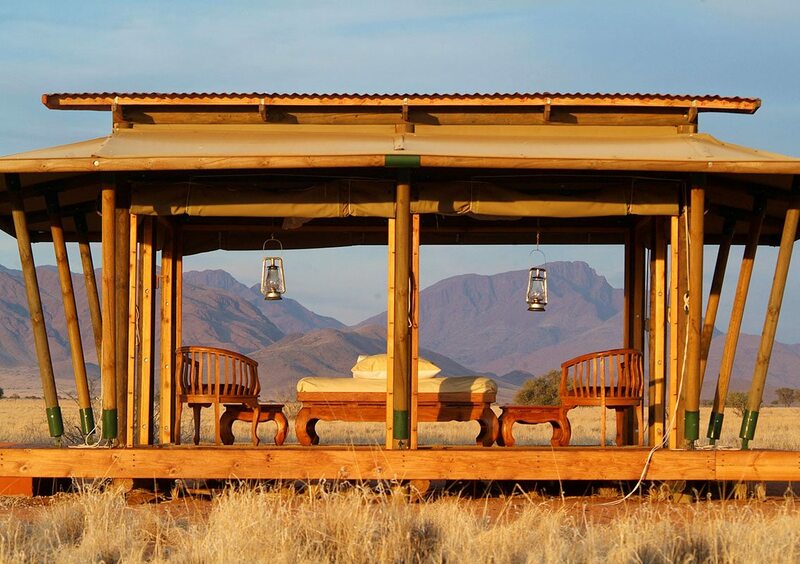 My partner joked that Wolwedans Private Camp does exactly what it says on the tin. 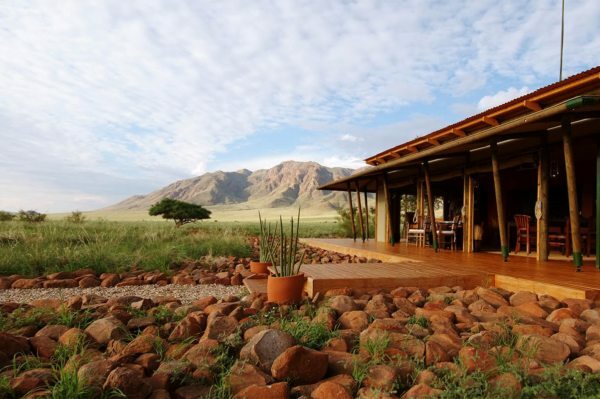 We were delighted to have discovered our very own family hideaway set deep in a valley in Namibia’s NamibRand Nature Reserve and, to enhance the wonderful sense of solitude created by the almost lunar landscapes, we’d booked private activities so that it would be just the four of us and our guide. After a family dinner, we spent our first evening in raptures, gazing up at the Milky Way, watching shooting stars, and treading gingerly on a scorpion safari. Who knew that they glowed under UV light? The next morning, we focused on just the one star, waking early to watch the sun rise, its rays chasing the shadows across the valley floor. The air was delightfully fresh, and while three of us clutched steaming mugs of hot chocolate, our eldest clicked away softly with her birthday camera. She’d already developed a real knack for photography, but as she explained, having time to compose her shots, and such inspiring scenery to capture, meant that she could hardly go wrong. As the first sunbeam reached us, we agreed that a lazy morning was in order, and had breakfast on the rocks. As if the views from Wolwedans Private Camp were not spectacular enough, my partner had secretly booked a hot-air balloon flight over the NamibRand Nature Reserve for us. My vertigo disappeared as nervousness was replaced by a sense of wonder. 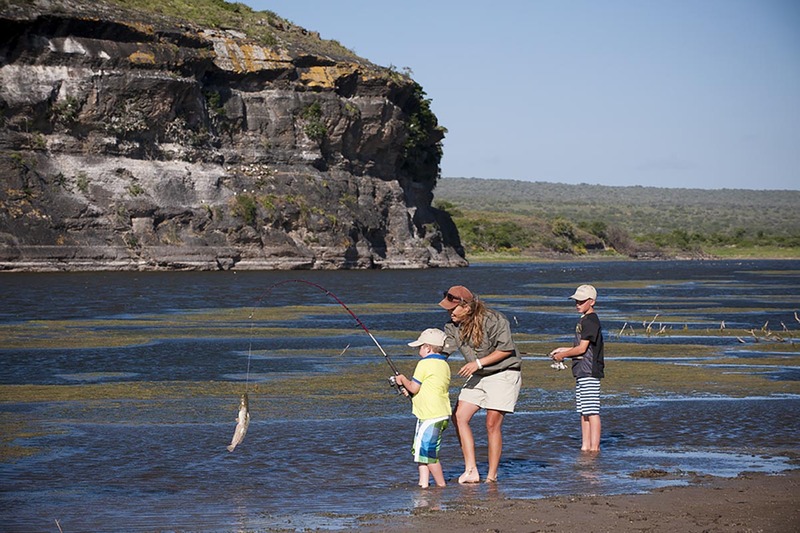 Knowing that the golden plains and rugged rocks beneath had been virtually unchanged for millennia reminded us that our time on Earth was fleeting in comparison, and that family moments like this were the very best way to spend it. Surrendering to gravity to enjoy a Champagne breakfast, we yielded to entreaties to share our Champagne with the girls. Our youngest daughter has always enjoyed horse riding, and the rest of us needed little persuasion to take a canter through the flaxen fields of the valley on our fourth day. It was another perfect moment we didn’t want to end, so we pulled gently on the reins to slow our mounts and try and stretch out each precious minute. Riding back to Private Camp, the setting sun cast giant centaur shadows ahead of us, and I found myself reflecting on how we seemed to have drawn even closer together as a family over the days we’d spend in this country of vast distances. A succession of flights brought us across the border, and into South Africa and a very different landscape. We especially loved the last leg, along the coast from the ‘friendly city’ of Port Elizabeth – a nickname that could apply to anywhere we went in this welcoming country.Although we weren’t the only guests staying in Kwandwe Private Game Reserve, we really felt that we might be. Staying at Melton Manor meant we were in a secluded part of the reserve, and essentially had our own slice of Africa. The combination of the reassuring solidity of our private villa and peaceful vistas of wooded hills, meant that we were soon even more relaxed. The range of activities on offer (when we were ready, of course) was just as tempting as lounging in the suntrap courtyard with its pool. Before that, there was the important business of choosing our pizza toppings.Now that the girls were older, they could join us on all the safari activities – another bonus of taking this trip now. 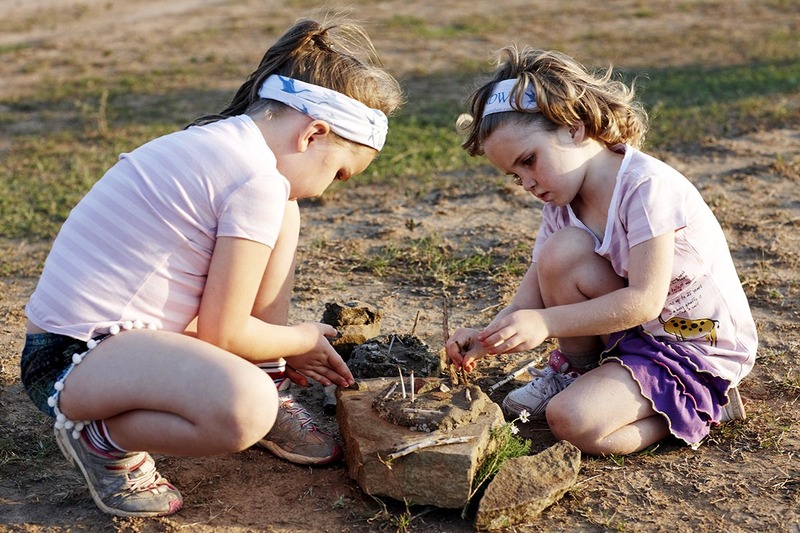 The range of kids’ activities on offer was impressive and imaginative, and just a few short years ago the holiday would have passed in a whirl of face-painting and cookie baking. 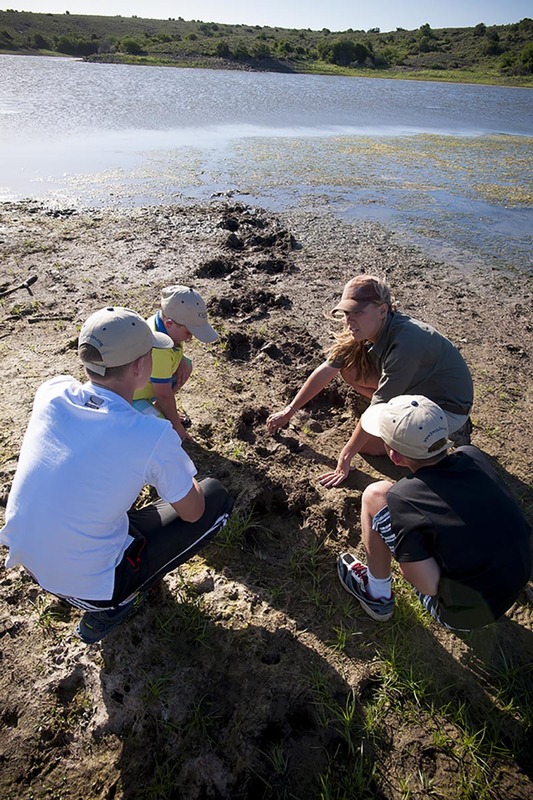 Instead, we set off with our guide to meet the Kwandwe rhino-monitoring team. They were modest both about their tracking skills and the importance of their work, and the oddly cloudy morning was illuminated by radiant smiles from two teenagers falling in love with a white rhino calf.Having our own ranger, tracker and 4×4 vehicle meant that we didn’t have to start our game drive at dawn – so we didn’t. In defiance of conventional wisdom, we only set off as the sun was climbing higher in the sky and the animals should have been moving to the shade. It seems, however, that the mother cheetah and her two cubs hadn’t received this memo, and we spent a good hour watching her attempts to get the youngsters to stay put while she went to hunt. We were happy not to have seen a kill, but wouldn’t have missed playtime for the world! A succession of flights brought us across the border, and into South Africa and a very different landscape. We especially loved the last leg, along the coast from the ‘friendly city’ of Port Elizabeth – a nickname that could apply to anywhere we went in this welcoming country. Although we weren’t the only guests staying in Kwandwe Private Game Reserve, we really felt that we might be. Staying at Melton Manor meant we were in a secluded part of the reserve, and essentially had our own slice of Africa. The combination of the reassuring solidity of our private villa and peaceful vistas of wooded hills, meant that we were soon even more relaxed. The range of activities on offer (when we were ready, of course) was just as tempting as lounging in the suntrap courtyard with its pool. Before that, there was the important business of choosing our pizza toppings. 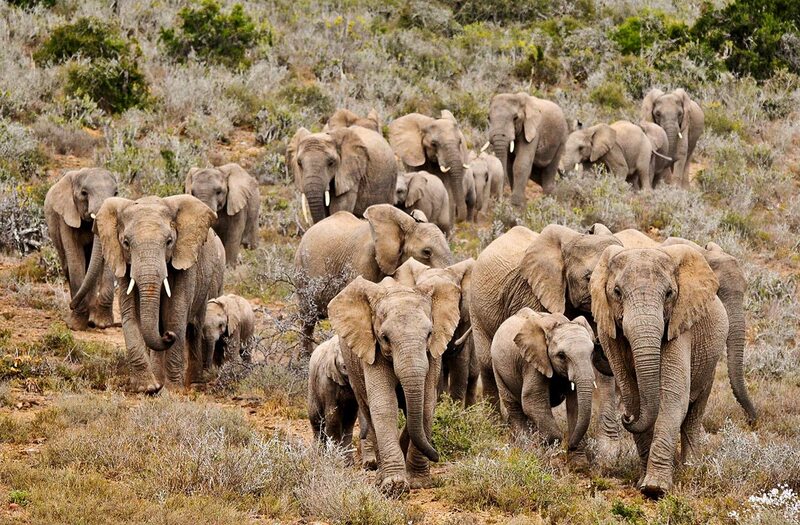 Now that the girls were older, they could join us on all the safari activities – another bonus of taking this trip now. The range of kids’ activities on offer was impressive and imaginative, and just a few short years ago the holiday would have passed in a whirl of face-painting and cookie baking. Instead, we set off with our guide to meet the Kwandwe rhino-monitoring team. They were modest both about their tracking skills and the importance of their work, and the oddly cloudy morning was illuminated by radiant smiles from two teenagers falling in love with a white rhino calf. Having our own ranger, tracker and 4×4 vehicle meant that we didn’t have to start our game drive at dawn – so we didn’t. In defiance of conventional wisdom, we only set off as the sun was climbing higher in the sky and the animals should have been moving to the shade. It seems, however, that the mother cheetah and her two cubs hadn’t received this memo, and we spent a good hour watching her attempts to get the youngsters to stay put while she went to hunt. We were happy not to have seen a kill, but wouldn’t have missed playtime for the world! The final, shortest leg of our journey to Tintswalo Atlantic was the best – descending by shuttle below Chapman’s Peak to the very edge of Cape Town’s sea. If you can imagine the contradiction in terms that would be a luxury shipwreck, we had found it.We’d briefly considered a cruise as our main family holiday this year, but had come to our senses and chosen a luxury family safari instead. 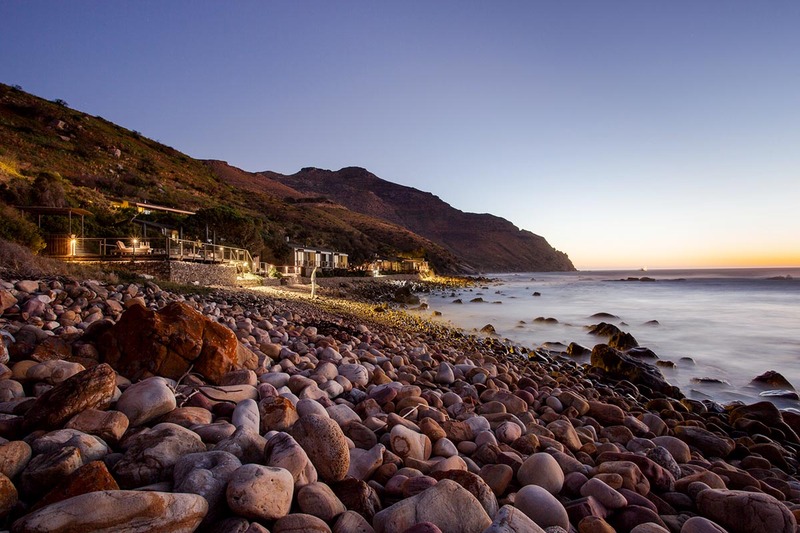 The salt tang in the air at Tintswalo Atlantic however gave an authentic maritime feel to our stay and we resolved to make the most of being oceanside. 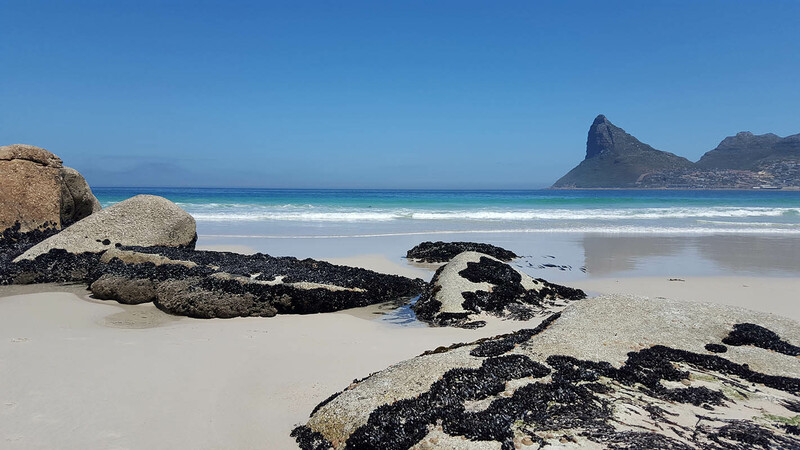 Spending the afternoon at Hout Bay Beach gave our tans a top-up, and we were still back at our boutique hotel in time to potter around the rockpools. Later, over sundowners, we used the telescope on the deck to scan for passing whale, and admired the rugged silhouettes above us.The cable car to the top of Table Mountain ended far too quickly, but the views from the top extended for miles. Our guide pointed out Robben Island, and landmarks in the City Bowl. We were early enough that ribbons of sea mist still hung there between the skyscrapers, but at our rarefied altitude the air was crystal clear. Our customised city tour was precisely geared to our interests, namely walking in Nelson Mandela’s footsteps, and experiencing local café culture. Below the Town Hall balcony, you could almost still hear the jubilant crowds greeting Madiba, and the steampunk espresso was similarly energising.We couldn’t come to Cape Town without visiting the Cape itself, and our Cape Peninsula tour turned into a fascinating day out that had a little bit of everything: comedic moments with the Simon’s Town penguins, lonely lighthouses, exquisite seafood, and roads seemingly built to film car commercials on. 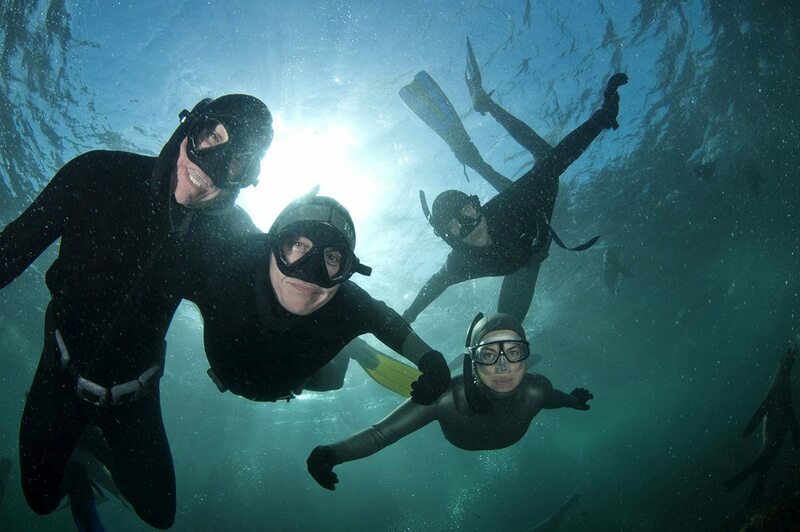 The highlight, however, was our scheduled trip to go snorkelling with the Duiker Island seals. Their playful curiosity, as they weaved between strands of kelp and streams of silver bubbles, brought out the delighted child in each of us. It was far and away the best family trip to the seaside ever! The final, shortest leg of our journey to Tintswalo Atlantic was the best – descending by shuttle below Chapman’s Peak to the very edge of Cape Town’s sea. If you can imagine the contradiction in terms that would be a luxury shipwreck, we had found it. We’d briefly considered a cruise as our main family holiday this year, but had come to our senses and chosen a luxury family safari instead. 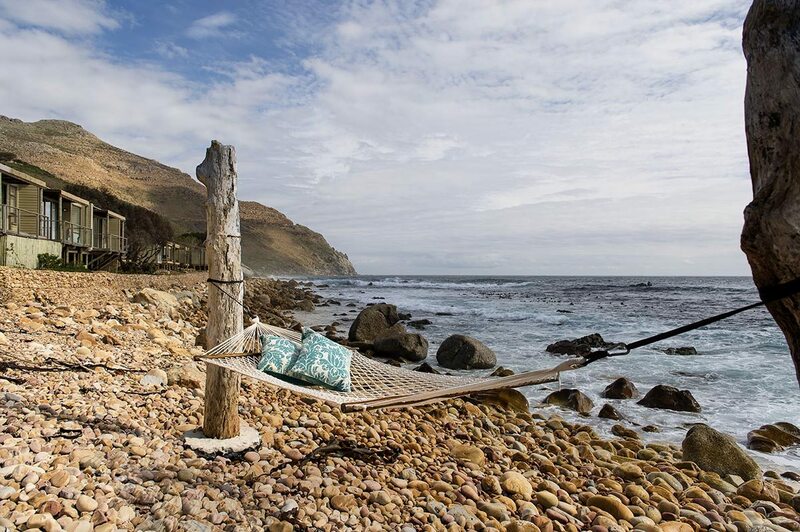 The salt tang in the air at Tintswalo Atlantic however gave an authentic maritime feel to our stay and we resolved to make the most of being oceanside. Spending the afternoon at Hout Bay Beach gave our tans a top-up, and we were still back at our boutique hotel in time to potter around the rockpools. Later, over sundowners, we used the telescope on the deck to scan for passing whale, and admired the rugged silhouettes above us. The cable car to the top of Table Mountain ended far too quickly, but the views from the top extended for miles. Our guide pointed out Robben Island, and landmarks in the City Bowl. We were early enough that ribbons of sea mist still hung there between the skyscrapers, but at our rarefied altitude the air was crystal clear. Our customised city tour was precisely geared to our interests, namely walking in Nelson Mandela’s footsteps, and experiencing local café culture. Below the Town Hall balcony, you could almost still hear the jubilant crowds greeting Madiba, and the steampunk espresso was similarly energising. We couldn’t come to Cape Town without visiting the Cape itself, and our Cape Peninsula tour turned into a fascinating day out that had a little bit of everything: comedic moments with the Simon’s Town penguins, lonely lighthouses, exquisite seafood, and roads seemingly built to film car commercials on. The highlight, however, was our scheduled trip to go snorkelling with the Duiker Island seals. Their playful curiosity, as they weaved between strands of kelp and streams of silver bubbles, brought out the delighted child in each of us. It was far and away the best family trip to the seaside ever! 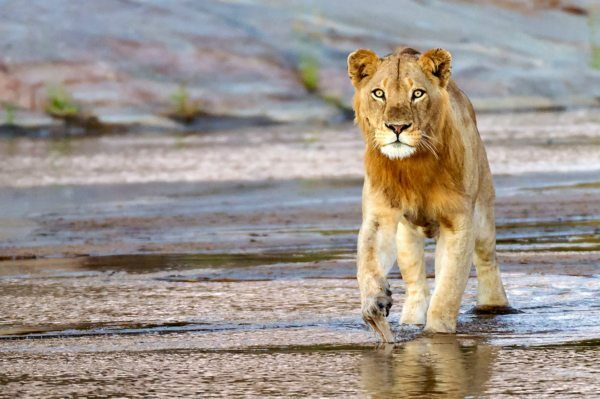 The timeless quality of Namibia’s ancient landscapes was our first clue as to what would make this luxury family safari such a special experience for our family. Simply all being in the same place, together, for more than five minutes, was a wonderful novelty in itself. I couldn’t remember the last time we were all free at the same time.Being able to decide our own schedule each day was very refreshing. By booking family villas and suites for our entire itinerary, we were assured of a degree of seclusion and privacy we often found ourselves longing for but never quite achieving at home.Best of all, we could simply be ourselves. I suspect it was a relief for our two teenagers to be able to drop the act of being cool, and to stop caring about the results of their latest test or Instagram post.The guides and staff at each of the luxury lodges were brilliant at knowing when we were keen to get out and about on activity, and when a game of Scrabble and a pot of tea were all that was needed. 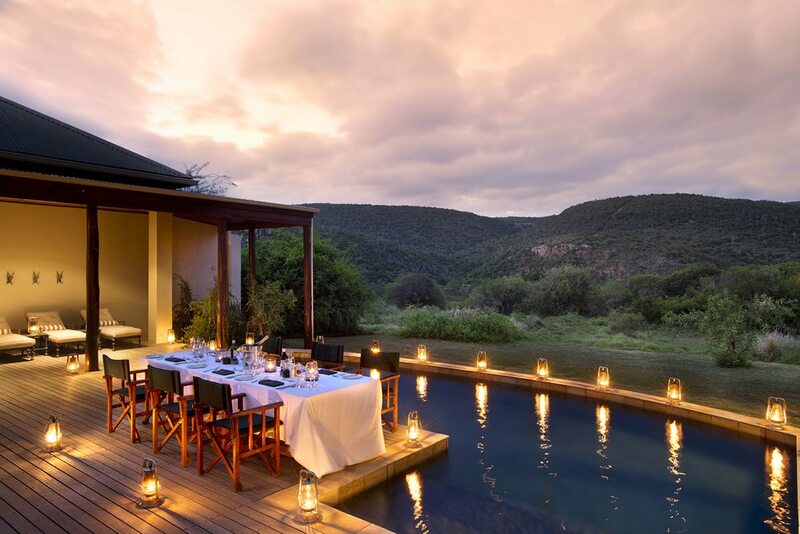 This luxury family safari came at a transitional time in the lives of our two daughters: with them both being on the cusp of adulthood, it was a real pleasure to see glimpses of the grown-ups they would become illuminated by flashes of the children they still occasionally were. And all this set against sinuous sand dunes, rolling green hills and crashing waves. 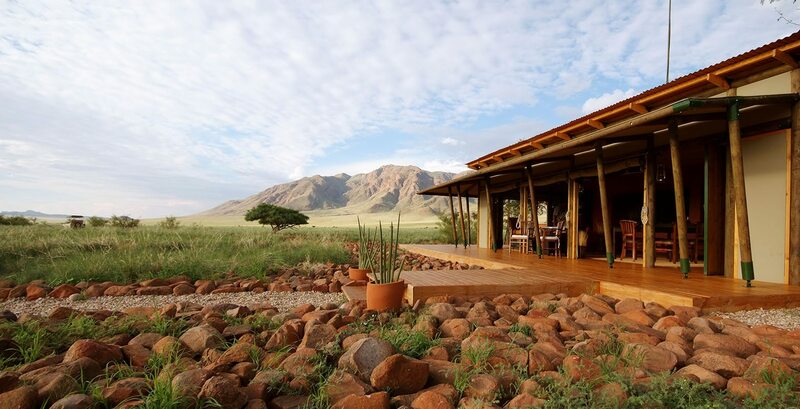 The timeless quality of Namibia’s ancient landscapes was our first clue as to what would make this luxury family safari such a special experience for our family. Simply all being in the same place, together, for more than five minutes, was a wonderful novelty in itself. I couldn’t remember the last time we were all free at the same time. Being able to decide our own schedule each day was very refreshing. By booking family villas and suites for our entire itinerary, we were assured of a degree of seclusion and privacy we often found ourselves longing for but never quite achieving at home. Best of all, we could simply be ourselves. I suspect it was a relief for our two teenagers to be able to drop the act of being cool, and to stop caring about the results of their latest test or Instagram post. The guides and staff at each of the luxury lodges were brilliant at knowing when we were keen to get out and about on activity, and when a game of Scrabble and a pot of tea were all that was needed. 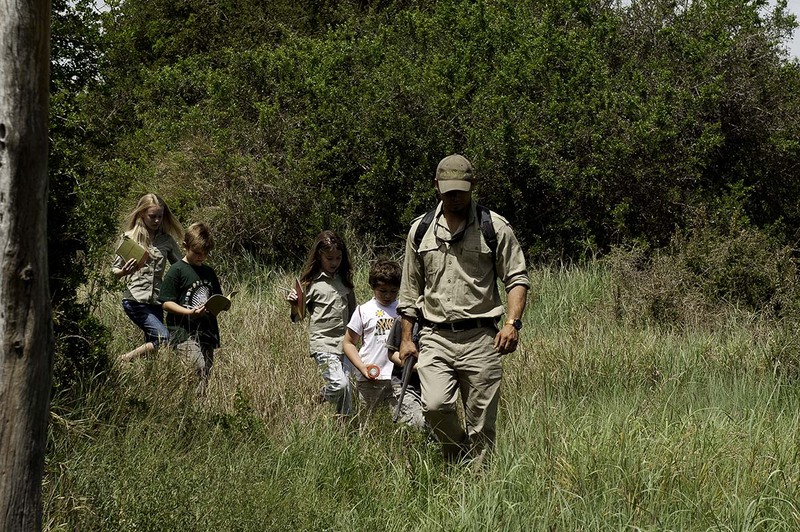 This luxury family safari came at a transitional time in the lives of our two daughters: with them both being on the cusp of adulthood, it was a real pleasure to see glimpses of the grown-ups they would become illuminated by flashes of the children they still occasionally were. And all this set against sinuous sand dunes, rolling green hills and crashing waves. You’ll be met as you disembark from your international flight at OR Tambo International Airport in Johannesburg, South Africa, and assisted through customs and immigration. A scheduled flight will take you to Windhoek in Namibia, and a scheduled light-aircraft flight will take you to Wolwedans. 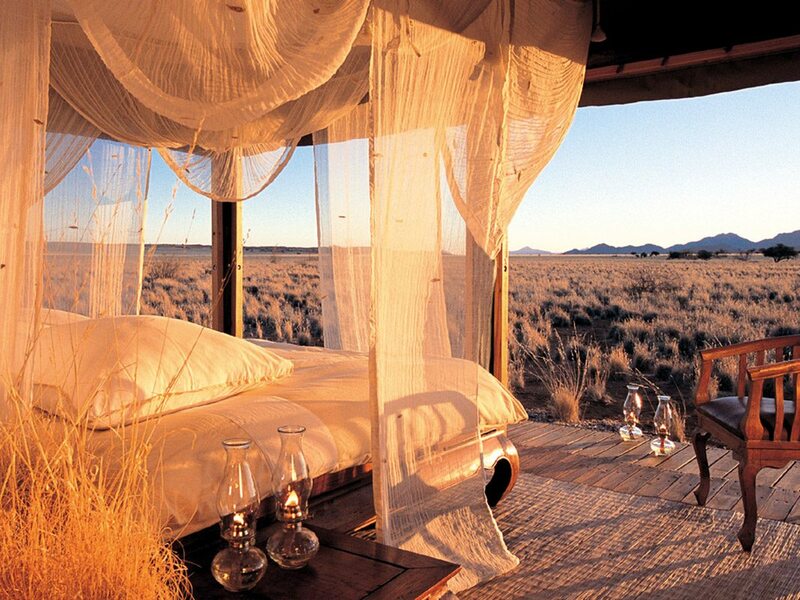 A transfer will then take you to Private Camp, where you’ll spend four nights. After a transfer from Private Camp to the airstrip, you’ll take a scheduled light-aircraft flight to Windhoek. A scheduled flight will take you to Port Elizabeth in South Africa, and a scheduled light-aircraft flight will take you to Kwandwe. A transfer will then take you to Melton Manor, where you’ll spend three nights. 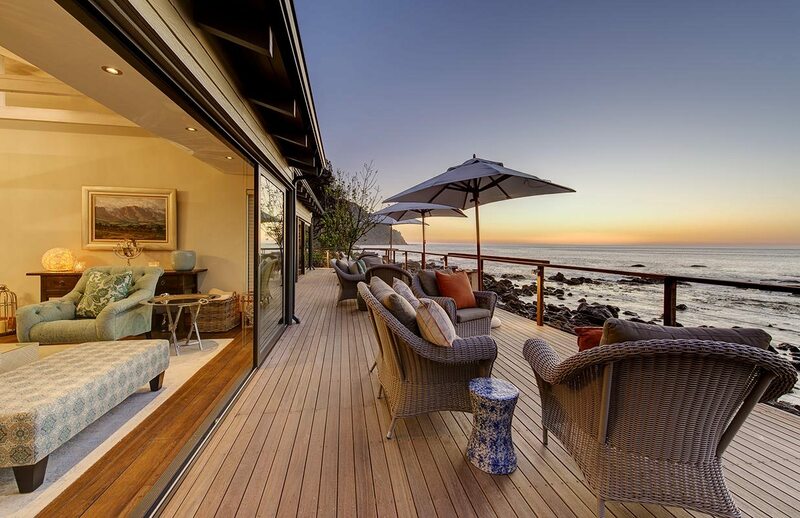 After a transfer from Melton Manor to the airstrip, you’ll take a scheduled light-aircraft flight to Port Elizabeth, and a scheduled flight to Cape Town. A private transfer will then take you to Tintswalo Atlantic, where you’ll spend three nights in a family suite. After a private transfer from Tintswalo Atlantic to the airport, you’ll take a scheduled flight to OR Tambo International Airport in Johannesburg, to connect with your international flight.